Elk Set up and management – We got this. As cloud deployments grow more complex as IT organizations scale, it becomes more difficult to isolate and query log data from the increasing number of applications, networks, services, and other systems. CyberHunter provides complete visibility into one’s entire cloud infrastructure by centralizing all log data into a single dashboard. The ELK Stack is a collection of three open-source products – Elasticsearch, Logstash, and Kibana – all developed, managed and maintained by Elastic. Elasticsearch is a NoSQL database that uses the Lucene search engine. Logstash is a log pipeline tool that accepts data from different sources, performs various transformations, and exports the data to multiple targets. Kibana is a visualization layer that works alongside Elasticsearch. The stack also includes a family of log shippers called Beats, which led Elastic to rename ELK as the Elastic Stack. Although mostly used for business intelligence, security and compliance, and web analytics purposes, the ELK stack is commonly used for centralized logging in IT environments. Logstash will collect and parse the logs, while Elasticsearch indexes and stores the data. Kibana then presents the information through visualizations that provide actionable insights. Why is ELK So Popular? The ELK Stack fulfills a need in the domain. 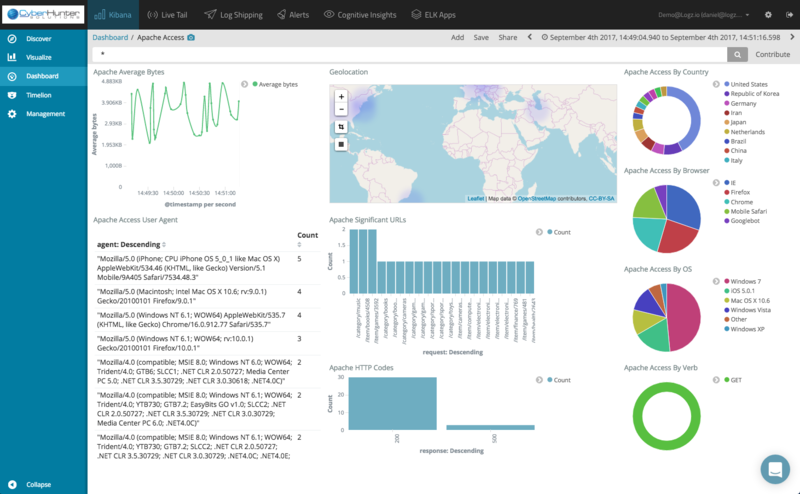 Splunk’s enterprise software has long been leading log analytics, but its numerous functions are not justified in the cost, especially for tech startups and other smaller companies. Splunk has a smaller number of customers because of this, while ELK has been downloaded more in one month than Splunk’s total customer count many times over. ELK may not have all of the features that Splunk has, but it doesn’t require those extensive features. What ELK lacks in features is made up in its robustness and simplicity at a fraction of the price. In short, IT organizations have long been in favour of open-source products in general, and this is why newer proprietary log analysis software platforms such as Sumo Logic, which self-reports only one thousand customers, may find it difficult gaining traction in today’s environment. After all, how do Netflix, Facebook, Microsoft, LinkedIn, and Cisco monitor their logs? With ELK, of course.